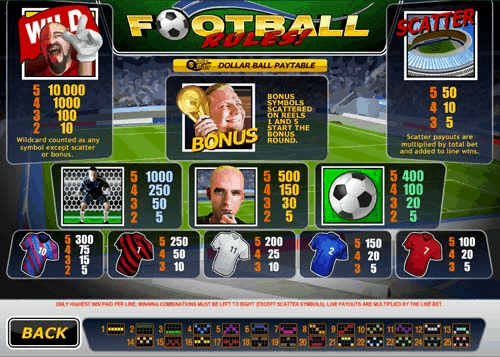 Football Rules is a 5 reel and 25 payline online slot game by Playtech. The game has a football theme and the reels are filled with football jerseys, adoring fans and other football-related imagery. The graphics are simple but bold and quite realistic and the audio is a mixture of football anthems and cheers from fans. The game's backdrop is a grassy, green football field. The plain green background allows the symbols to really pop so there is no mistaking winning combinations. The low value symbols of the 5 Football Jersey symbols pay players between 100x and 300x their bet for 5 of a kind. The Soccer Ball pays players 400x their bet for 5 of a kind while the referee pays 500x for the same combination. The Goal Keeper is the game's most valuable standard symbol and rewards players with 1000x their bet for winning combinations. 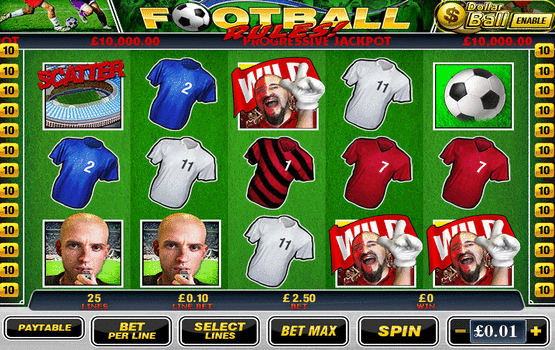 The Free Spins Bonus game is activated by landing World Cup symbols on both reel 1 and 5 simultaneously. Players will then need to choose between a variety of footballs that can award them between 1 and 20 free spins. Players get to add a multiplier to the mix too by selecting the direction in which to take a penalty. The maximum multiplier offered is a 10x multiplier. 5 free spins will be awarded to players who land Bonus symbols on reels 1 and 5 during the free spins. Like a few other Playtech games, Football Rules offers the Dollar Ball Progressive Jackpot. It can be enabled by clicking the button in the top right-hand corner. Players can then play a lottery-style game for a chance to win a life changing jackpot sum. The Wild Symbol in this game is the icon of the Football Fan that is clearly marked as 'WILD'. This symbol has the ability to replace all other standard symbols in the game, thus greatly increasing the chances of landing winning combos. The only symbols it cannot substitute for is the Stadium Scatter and the World Cup Bonus symbol. The Wild also acts as an individual symbol and is the game's most valuable icon. If players land 5 of these in a winning combo they will be rewarded with 10,000x their bet. Blue & Red Jersey, Black & Red Jersey, White Jersey, Blue Jersey, Red Jersey, Goal Keeper, Referee, Soccer Ball. The Wild symbol is the Soccer Fan. It can replace all other game symbols except for the Scatter and the Bonus symbol. The Scatter symbol is the icon of the Stadium, which payouts are multiplied by the total bet and added to the winnings. The Bonus symbol is the Player holding the Trophy. It unlocks the bonus round that awards players with free spins. Football Rules is a truly impressive game from Playtech, especially considering it is over a decade old. The Bonus features in this game are simple yet effective and the Dollar Ball Progressive Jackpot definitely ups the anticipation. The graphics are well designed for its time and the game is colorful and easy to play. The game should suit a variety of players as it has an array of betting options and bonus features to suit both novices and high rollers alike.